Marion Bethel was born and lives in Nassau, The Bahamas. She read law at Cambridge University, England and has worked as an attorney since 1986. She has two collections of poems and is currently working on a third manuscript of poetry and a novel. In 2012, she produced and directed the documentary Womanish Ways: Freedom, Human Rights & Democracy, the Women’s Suffrage Movement in The Bahamas 1948 to 1962, a documentary on the struggle to gain women the right to vote in the Bahamas. OPA: You are an attorney, a poet, and a mother. Have you always written? MB: I started writing seriously in 1986 during the final year of my Bar examinations. I deferred my Bar exams in order to spend a full summer writing poetry. During this period I wrote the draft of Guanahani, My Love, my first poetry collection. OPA: How does the job as an attorney feed or distract from your writing? MB: The time spent as an attorney often feels to be in conflict with time needed for my creative writing process. On the other hand, I see that there is enough time for me to do my writing if and when I am committed. I can waste a lot of time procrastinating and getting ready to write instead of just writing. I really thought that practicing law & the pursuit of justice could satisfy me. However, I feel closer to & am more coherent with social justice in writing poetry. OPA: How does motherhood figure into your writing? MB: While being a parent or mother takes lots of time within any one day, the major part of that time is now behind me as my two daughters are in their twenties. But yes, when they were young, I felt torn between taking care of them and paying attention to my writing. It is interesting that both of my poetry books were started and completed when my daughters were still principally in my care. It may be then that the tension facilitates focus, productivity and attention when I actually sit down to write. OPA: You have been widely published and recognized in the writing world, what has that journey been like? MB: It’s been an uneven journey, that is, there have been and continue to be productive and unproductive periods, focussed and unfocussed time. My expectation of myself is much higher than my actual productivity or production. It’s been a journey of great gifts to me. I must give thanks for the opportunity to attend the Caribbean Writers Summer Institute at the University of Miami in 1991 where I attended workshops with George Lamming and Kamau Brathwaite. Coming out of that experience I worked on Guanahani, My Love. It was so wonderful to be awarded the Casa de Las Americas prize in 1994 for Guanahani, My Love. I was then invited to participate in the Miami Book Fair. Further, I have been a guest speaker at several colleges and universities over the years. In 1996 I was fortunate to gain a fellowship at the Bunting Institute at Radcliffe College. This was one of the highlights of my journey where I spent twelve months at Harvard University with 39 other women artists, scientists doing our individual work. Another highlight was my time at Cave Canem (2007 – 2009) under the direction of Toi Derricotte and Cornelius Eady. I loved this experience in the company of brilliant young, African American poets who challenged me to sharpen my poetry skills. In 2010 I founded a writer’s institute with Helen Klonaris here in the Bahamas. This was also a gratifying part of my journey. OPA: How does your new collection, Bougainvillea Ringplay, differ from your first? MB: Guanahani, My Love was the direct result of the poetry workshop with Kamau Brathwaite and my attempt to employ specific poetry forms in the service of telling the history of The Bahamas. Bougainvillea Ringplay was more politically personal. In BR I felt infinitely more confident both in technique & content to explore different forms and subject matter. There was tremendous growth in BR. The poetic voice is sharper, bolder. The poetic imagination is more expansive. OPA: Of course this poem is as much about the characteristics of the bougainvillea plant/flower, personified as a girl, as it is about a girl/woman who is as tenacious as the plant. Can you talk about the stance in this poem, and the parallels you are drawing about the rootedness as well as resistance and determination evident in Caribbean people? MB: The poem, BR, really evokes for me childhood memories of fluidity, wild abandonment, freedom even in the face of overwhelming restrictions in regard to colonial education & curriculum, church traditions, family and social expectations. This freedom came ironically in the school yard where we played ring play games every day in between the rigidity of learning and supervised behaviour. Bougainvillaea were everywhere from the time I left home in the morning en route to school and church. The colours and the expression of the bougainvillea evoke for me the resilient spirit of childhood that transforms and matures into the spirit of young womanhood. It is rooted, affirmative, resistant and eternal. OPA: In the bougainvillea tree, I catch a glimpse of freedom, physical, emotional, mental & spiritual. This is the beauty of the Caribbean spirit at its best in music, dance, and poetry. 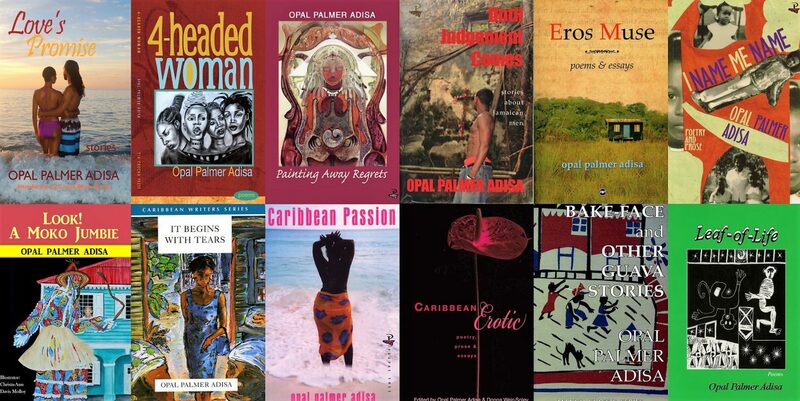 Is it important that Caribbean writers use local imagery, fauna, flora, culture? MB: Yes, I think it’s imperative that I use Caribbean local imagery, fauna, flora. The physical world has shaped our sensibility and spirituality and we have humanized our physical world. At some point in our existence we are one, i.e., the physical and human environment. I affirm the Caribbean presence in the use off Caribbean imagery. OPA: The belief is, the more you do something, in this instance writing, the more proficient or better you become. Can you chart your development as a poet? Do you see the growth in this collection, and if so in what ways? MB: This poem felt so me, integrally me. And a me that I would hope is so Bahmian, so Caribbean and so whole. I felt entirely connected to my centre, my self and ultimately my universe when I was writing this poem. This poem is the one from which all the other poems pivot. The other poems are in dialogue with BR in regard to authenticity of expression and their reach for freedom. OPA: As a child growing up, we played ring games, I don’t know if that happens so much these days. What was your process of writing this collection? OPA: I read this poem in Spain, and it was translated, but at the end of my presentation a few of the participants asked me what is ringplay? How would you explain it to a non-Caribbean audience? MB: Ringplay is a childhood game of dance, song and drama that is performed in a circle. One person jumps into the ring & shows her bodily rhythm, sensuality and sexual energy in dance while the circle claps & sings her on sometimes to the point of a frenzy. Ringplay may have religious origins in African spirituality.